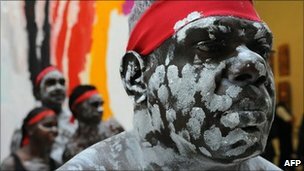 The BBC New posted "Australia in 'national crisis' over Aborigine jailings. Faced for hundreds of years with physical and cultural annihilation, Aboriginal youth represent 60% of the inmates in juvenile prisons while comprising only 2.5% of the population. For African Americans, this statistic may sound familiar: Despite lower crime rates, the US Bureau of Justice Statistics estimate that four out of five black youth will at some time find themselves in prison. As reported by BBC News, Australian Aboriginal communities also suffer the added threat of suicide among their youth, now four times higher than non-Aboriginals. Reasons are complex. Most damaging was the 1905 Aborigines Act, strengthened under A. O. Neville, Chief Protector of Aborigines, in 1936. This legislation gave the Australian government sweeping powers over part Aboriginal children, include the right to legally remove any 'half caste' children from their families, placing them in boarding schools or, in the case of lighter skinned children, giving them to White Australians. 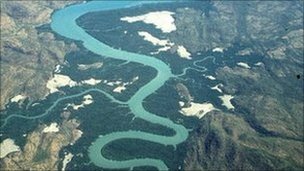 The aim was to force the extinction of Aboriginal people altogether. This horrendous policy continued until the 1970s, leading to the disruption of Aboriginal communities and the abuse of Aboriginal children placed in institutions and foster care. I once attended a conference in Sydney on economic development opportunities for Aboriginal communities and the film Rabbit Proof Fence was recommended by nearly everyone I met of Aboriginal descent. It takes place in 1931 and tells the amazing true story of three Aboriginal girls, Molly, Daisy, and Grace (two sisters and a cousin who are 14, 10, and 8) who are taken from their home and sent to a boarding school thousands of mile away. The girls run away and over several months, walk back to their families through the outback - all the while evading their captors. I screen this film in my classes at the University of Connecticut, most semesters along with Stolen Generations, That documentary uses three true stories to illustrate the damage done by the Aborigines Act. Between 1910 and 1970 in Australia, 1 in 3 children were removed from Aboriginal families and placed in institutions and foster homes. These children, in most cases, were never to see their families again. Both films inevitably spark interest in the topic of ethnocide and genocide among students. They also compare the plight of the Aboriginals to that of Native Americans in the US who were also stolen from their homes and placed in boarding schools. Forced to learn English, punished for speaking their own languages, these children were taught to be domestic workers and laborers, what was called 'industrial education;' many died of disease and overwork. Like Aboriginals, many Indians in America still carry scars and suffer psychologically and physically from the harm done to their communities in the past. For those who like books, I also use a wonderful autobiography written by Sally Morgan, an Aboriginal woman, called My Place. Ms. Morgan, also an accomplished artist, tells, through her own family history, how Aboriginal people embodied and physically experienced everyday fear and prejudice. Finally, for those looking for a more theoretical, historical and 'academic' look at racism in Australia and the 'stolen generations,' I recommend Blacklines: contemporary critical writing by indigenous Australians. For "Australia in 'national' crisis over Aborigine jailings," click here. For "Australia's Aboriginal suicide rate sparks concern," click here.